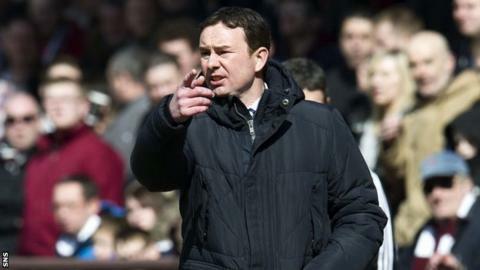 Derek Adams expects a red hot atmosphere against a buoyant Hearts but hopes Ross County's generosity can turn Tynecastle into a sea of joyous blue. An agreement in Lithuania this week took Hearts closer to coming out of administration under a new owner. County have done their bit to bolster their own support by funding free bus travel for their fans to Edinburgh. "The club, the players and management have put money in to get fans travelling," said manager Adams. "All we're doing is trying to get the fans to Tynecastle on Saturday to give the players the vocal backing they deserve. "The fans have to pay for their ticket, but I'm just glad everybody's got together and been able to provide the transport for them." While the home side will be looking to celebrate their heartening financial news despite their relegation having already been confirmed, County are seeking points in their bid to avoid a play-off to remain in the top flight. "It is a game where I think there will be a very good atmosphere," said Adams, whose club have also urged their fans to wear dark blue at Tynecastle. "The Hearts supporters will be delighted with their situation and I'm sure our supporters will bring a dark blue day to Tynecastle and they'll provide the atmosphere we deserve." Adams admits that being the most northerly of Scotland's senior teams normally leaves the Dingwall side at a disadvantage in terms of vocal support. "We have found it difficult at times away from home with the lack of supporters," he told BBC Scotland. "It is important that we have a good following to away games. "Without a doubt, it helps enormously if we can get a good travelling support, they generate an atmosphere and backing of the team then that gives the players a lift on the park." County are just one point clear of second-bottom Partick Thistle but only another three adrift of Hibernian and Adams believes his side will need to win their last five games to ensure they displace the Edinburgh side in seventh spot. Captain Richard Brittain is also eyeing the teams above but realises that the news from Lithuania could make Hearts even more dangerous opponents. "It might give them a lift," said the midfielder. "It is good to see a club coming out of administration and a new owner coming into a club, but we want to focus on ourselves and get the points on Saturday. "It is going to be huge to see a big following for us. I think we are on six or seven buses from the club and hundreds of others travelling by themselves. "It is fantastic for a club of our size to be taking the support we are and hopefully the boys can get a lift off that and repay them by taking something from the game."